There's this group of cacti which prefer to lie low on the ground and disguise themselves so as not to be seen by plant-eaters. I'd like to have some Lithops, but have not seen one yet. 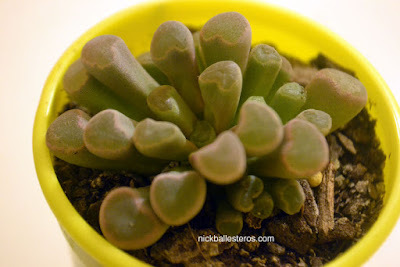 In the meantime, I have the split rock cactus (previous blog post) and the frithia pulchra. At the end of each tubular leaf is a 'window'; I suspect that in the wild this helps them blend in. This one's more difficult to narrow down into what specific Mammillaria this is, because there's so many under this classification. But what I do know about Mammillaria is that they are beautiful when they flower, as these form a ring around the cactus so it looks like they're wearing a lei or a garland of flowers. Mine's actually starting to flower! I can see a number of buds all the way around the cactus. 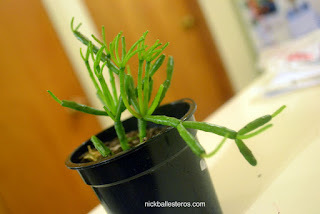 I learned something new when I got the Rhipsalis. This is an epiphytic cactus, meaning it grows on another plant (ie a tree). I does not do harm to its host (unlike parasites), it simply latches on and gets its nutrients from the air, rain, and what little nutrients it gets from its surroundings. 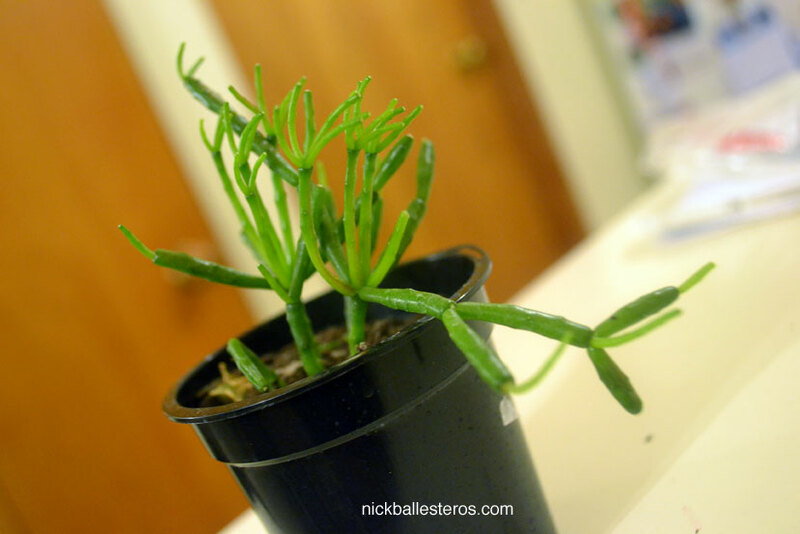 Epiphytic plants can be found in the tropics, and so does the Rhipsalis. It is a bit quirky, with finger-like extensions growing out from the main stem. A workmate gifted this one to me. 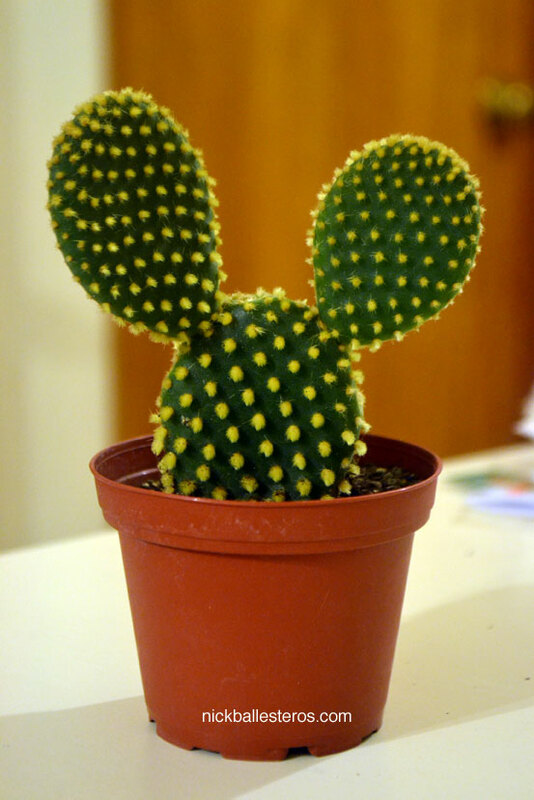 What a nice little cactus this is! It looks like a hidden Mickey! This must be related to the prickly pear, which I grew from our backyard back in my college days so many years ago. The prickly pear bore flowers quite regularly, and I hope this one does too. 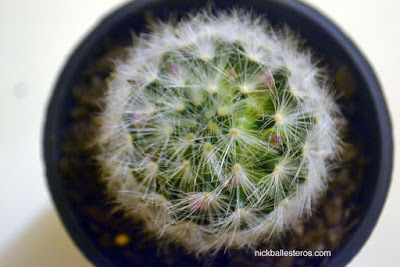 This is a columnar cactus (of which I have around 4 more). The special thing about this one is that it has white hair-like fiber wrapping its body. At first I though this was the Old Man of the Andes, but this one looks more like the Espostoa nana. Aside from the hairy extensions, it has soft spines surrounding the cactus, so I have to be careful when handling this one. 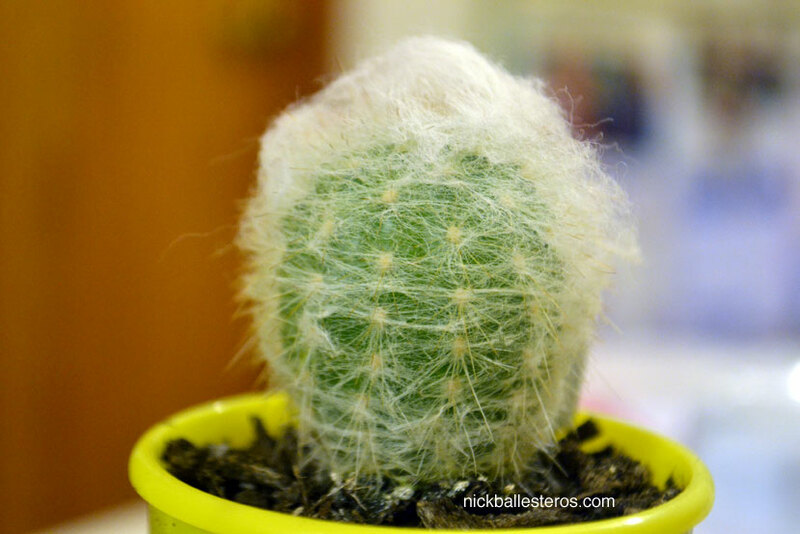 Never underestimate the spines on a cactus! It would look harmless but soon you would be plucking out fine prickly needles from your fingers using a pair of tweezers. Ouch. That happened to me, so I know. And that's it for this round!